Canadian thanksgiving is right around the corner. It is one of my favourite weekends of the year because I celebrate at the cottage with my family. Up north, the leaves change colour much sooner than in the city so it’s a rather beautiful sight. Since my cottage is on an island, it’s also the last weekend we’re all at the cottage together before we close it down for the winter. I’m the health nut in the family so I usually try to contribute a vegetable dish and sometimes a healthier dessert. This year I will be making my Brussels Sprouts + Millet Salad with Umeboshi Vinaigrette and my new recipe for Sprouted Spelt Apple Pie. Unlike most of my other recipes on the blog it’s neither gluten-free or vegan. However, it does use whole and nutritious ingredients, such as grass-fed butter and sprouted spelt flour. When choosing to use dairy or egg products, I always strive to purchase products that are made humanely, whether that’s from either grass-fed cows or pasture-raised chickens. I will also research the farms online. It’s also a great idea to purchase butter and eggs locally from your farmers market. I’ve been slowly working gluten back into my diet and choosing to eat either fermented or sprouted grains. I chose to use sprouted spelt flour for this recipe because of its nutritional benefits, it’s ease on digestion, and for its delicious nutty flavour. You can read more about sprouted grains here. However, if you have trouble finding sprouted spelt flour, feel free to use regular spelt flour. 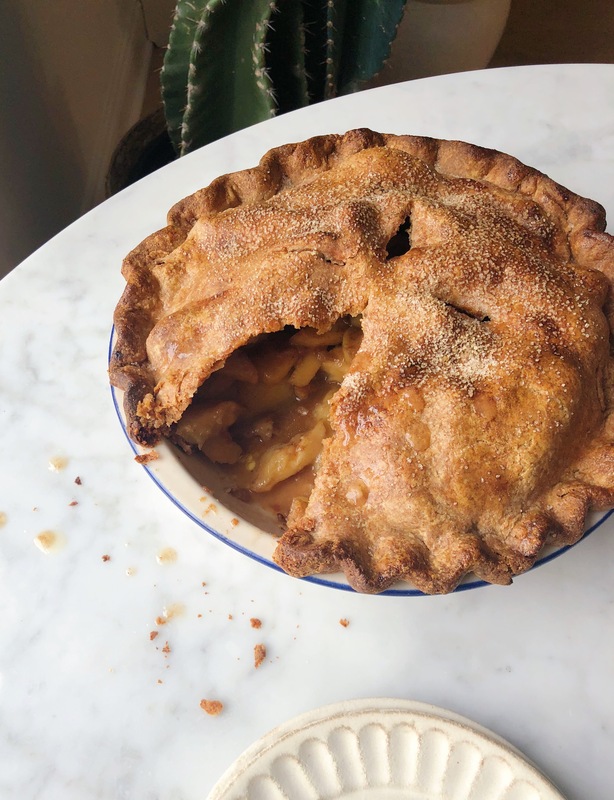 I hope you enjoy this apple pie as much as I do. It’s a wonderful recipe to celebrate the crisp autumn weather and fresh apples. Mix together the flour, sugar, and sea salt in a large bowl. Working quickly with your hands, or using a pastry cutter, work flour and butter together until it resembles coarse meal with some pea size shaped pieces. Add a tablespoon of cold water at a time, mixing in with a fork. Add enough water until dough begins to hold together. Knead the dough a couple of times and form a ball. Be sure to not overwork the dough! Divide the ball in half and form two discs. Wrap in plastic wrap and place in fridge for at least 1 hour or overnight. Remove one disc of dough from the fridge and allow to sit out for 5-10 minutes. On a lightly floured surface, roll out dough into a 12" circle about 1/8" thick. Make sure dough is not sticking to the surface bellow, adding a few sprinkles of flour will prevent this. Carefully place the dough onto the pie plate. Place in fridge for at least 30 minutes. Squeeze the juice of the lemon into a large bowl. Peel, core, and thinly slice the apples about and toss with lemon juice. Mix in the sugar, spices, and flour. Pour filling into chilled pastry lined pie dish. Roll out second disc of dough into a 12" circle. Carefully place over fruit. Trim the edges so there is about a 1" overhang, seal and crimp edges. With a sharp knife, create a few slits on the top of the pie crust (this will allow steam to escape). Chill for 30 minutes. After 30 minutes, remove pie from fridge and make the egg wash. Whisk together the egg and 2 tablespoons of water. Gently brush the pastry with egg wash and sprinkle with optional sugar. Bake pie for 45-60 minutes or until pastry is golden and juices are bubbling. Cool for 1 hour before serving. 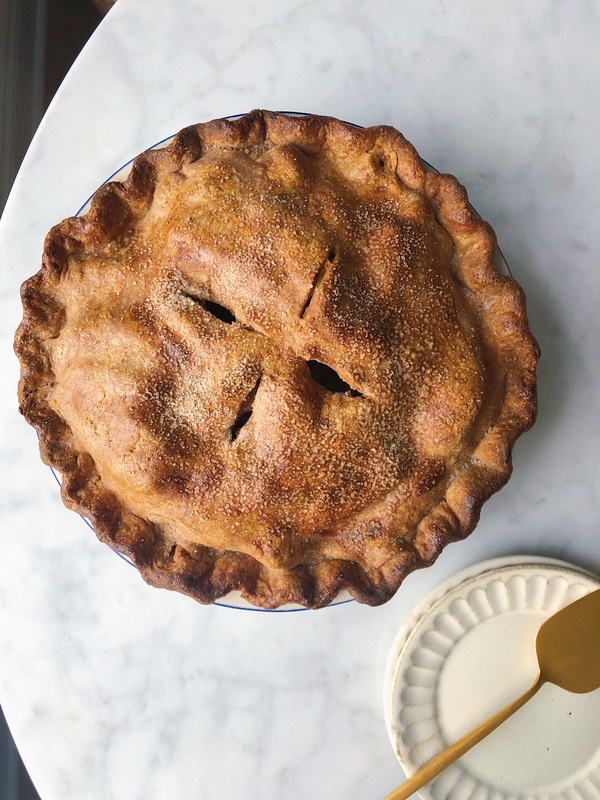 This entry was posted in Dessert and tagged apple pie, apples, Autumn, Baking, fall, fall baking, farmersmarket, harvest, local, organic, spelt flour, sprouted flour, thanksgiving. Bookmark the permalink.